German TV reported today (ZDF, “heute-Journal”, 21.45-22.00) on Liberian president Charles Taylor, his imminent abdication etc. The presidential flag was shown several times (behind Taylor together with the national flag; as car flag together with the national flag). Although it was not totally unfurled, it didn’t look like the reported flag. Instead of the shield in the form of the national flag it obviously showed the coat-of-arms in the center (plus the four stars in the corners). 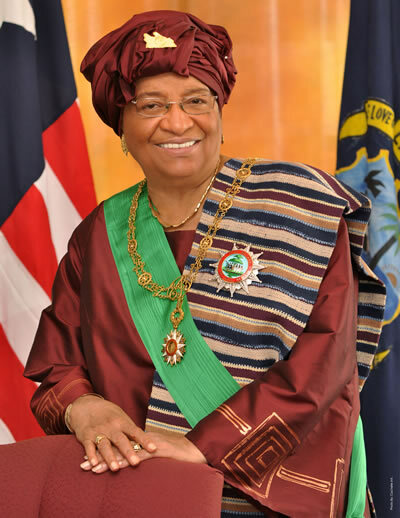 Different sources from different dates show different Liberian presidential flags. I don’t suppose that we will be able to trace exact dates of the changes of these. There seems to be photographic evidence of both flags in use recently, although scarce for the one with the simpler arms: The “new” flag, with the full coats of arms (ship etc. ), was in use still in Pres. Taylor’s time (as reported by Marcus Schmöger, 06 Jul 2003, above), while Pres. Sirleaf is some times shown using the “former” flag. It cannot be a mistake; my guess is that each flag represent a separate office, both held by the same person — maybe President and Commander in Chief of the Armed Forces? 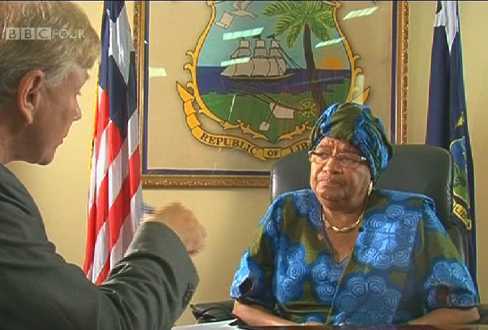 On 11 August 2009, “World News Today” on BBC4 tv carried a report on reconstruction in Liberia after the civil war, and there was an interview with the President in her office. Behind her were the national flag and what one would assume is the presidential flag. We can’t say from this screen grab that the flag is square (it could equally easily be the same ratio as the national flag), or that it has a white star in each corner. However, it is clearly not the earlier flag and it is consistent with what was reported in 2003. A photo of President Sirleaf said to be taken on 16 Jan 2007, the anniversary of her assumption of the presidency, shows the new flag. Flag with one star — visible — and arms. Apparently arms in centre, and one star in each corner. From these photos (that one in particular) looks very much that it has to be rectangular, not square. These images clearly shows yellow, not white, scrolls. One interesting fact is that the shield violates the rules of heraldry by having an odd number of red stripes, thus placing a blue chief (color) on a red shield (also color). The US solves this by changing the stripes to seven white, six red. This flag came into use after WWII, as the first mention that I am aware of is in [smi75c]. Possibly it is from 1965 as are the provincial flags, introduced by president Tubman. Also, possibly that the flag was abandoned with his era, too? Do we have any “modern” confirmation of this flag? President Tubman died and was succeeded by President Tolbert, who was overthrown and killed in a military coup in April 1980. On this photo (at the official website), red and white stripes on the President’s left. Webarchive has many past iterations of the Executive Mansion website from 23 Feb 2007 to 14 Feb 2008. They do not show the same photo of the President with the flag and striped shield. It seems that was added sometime after 14 Feb 2008 — would they add a photo then with an outdated flag? Or have they since reverted to the old version? Admirality 1955 book [hms55] shows 2:3 presidential flag with shield as in Album 2000 [pay00], but without the four stars. Flaggenbuch (1939-1941) [neu92] has flag that is virtually the same as the latter flag of military authorities, 2:3 blue flag with pally shield and star. The minor difference (black line around the shield, size of the charges) are probably of no significance. National Geographic Magazine (1917.10) [gmc17] has a variation of this that is square with yet different artistic rendition of the shield. This flag has the number 765 in the flag number of National Geographic Magazine (1917.10) [gmc17]. 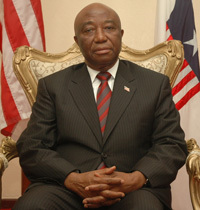 Probably the Liberian Vice President’s flag was seen on a photo, at the office (also probably) of the current VP and President of the Senate, Mr. Joseph N. Boakai. White field bearing a red-and-white striped shield having a blue chief with a white star? Definitely so. Photo at the official website shows the same, although also inconclusive about the details. It would seem that the basic pattern of the US office flags is followed also in this case, as in the (multiple) presidential flags: The US vice-president also uses a white flag with the coat of arms in the middle.